Explore our Intensive English, University Pathways, TEFL/TESOL Teacher Training programs and more! Our analysis of recent SEVIS (Student and Exchange Visitor Program) data on F and M students in the U.S. from the unique perspective of the Intensive English Program market. What do the numbers really mean for IEPs? TEFL/TESOL Training in the U.S. Learn more about this important research. 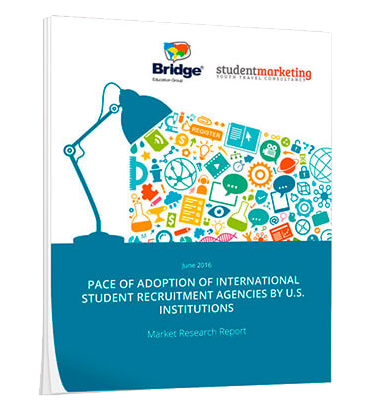 Phase II Research is coming soon: Student Insights on International Recruitment Agencies. Read a summary of this upcoming report. Our languages centers in South America offer English, Spanish & Portuguese programs. Bridge has seven centers in the U.S. Six of which are on a university campus. Bridge offers EFL teacher training, world languages classes, and translation services.